06.20.2012 - Special evening goes full circle with fun, food and philanthrophy Click Here for details. Someone once said, "A healthy society includes the active participation of women through philanthropy. giving of time, talents and treasure". 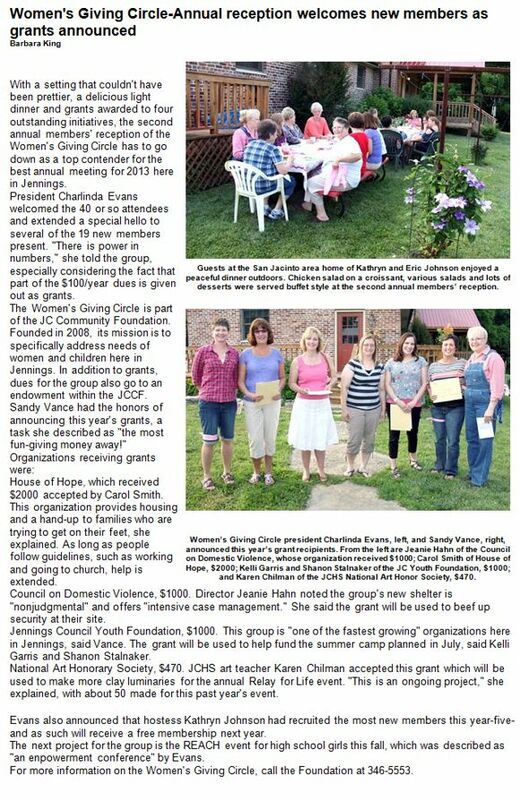 The Women's Giving Circle of Jennings County is an ideal example of Women in Jennings County fulfilling that role. The Women's Giving Circle was formed in 2008 by a group of 7 Women and continues to grow. At the 2011 REACH conference the Women's Giving Circle was able to announce $1800 in grants to benefit the Joy of Giving, Pantherfest and Domestic Violence programs. For more information about The Women's Giving Circle please call Linda Erler at 873-7421, Darlene Bradshaw at 346-1742 or contact the Foundation Office at 346-5553. Click Here to visit the Women's Giving Circle Facebook Page.